Oh my goodness, I’m not even a sentence into this post and already — especially seeing this picture again for the hundredth time — the happiest tears have sprung back to my eyes. Because it’s still sinking in that a week ago, the most extraordinary man I’ve ever met got down on one knee and took my hand and asked me to spend the rest of my life with him. And then afterwards, let’s be real — I totally lost it. ? Because I felt like I had been ready and waiting for this moment for years and years. But even in my wildest, most hopeful dreams — especially during those long seasons of waiting, hoping, believing it might be possible to meet someone amazing — gosh, I just never imagined that it could actually be this good. That he could be this good. That the reality of life together as “us” could be this good. But it truly is. It’s so good. And my heart could not feel more peaceful and thankful and joyful and just…full. Oh my gosh. Guys, WE’RE GETTING MARRIED!!!!!!!! And for those of you (like me!) who always want to hear all the details of a proposal, I thought I’d pop in today and share the full story. ? The whole night began when Barclay mentioned that he wanted to cook me dinner on Thursday night as a thank you for being supportive during his ultra-busy month of shows with his Christmas band, which was wrapping up their final gig the day beforehand. Seemed reasonable to me. ? Plus, I always love our date nights “in”, and was just excited that he had a free evening again. Sure enough, he showed up promptly at 5pm, mentioning that his aim was to have dinner on the table for us by 5:30pm (<– which he knows is my dream, because I’m an 80-year-old early-bird-dinner-lover at heart, and love eating the second I’m done with work.) But I admit that I was a bit amused to see him walk in the door with an enormous box of groceries…for just the two of us. This was not entirely surprising, since Barclay doesn’t keep an “extensively-stocked” kitchen, and literally does 100% of his grocery shopping at Costco. ? But still, it was a noticeable step up from his usual chopped-salad-in-a-bag specialty. Still, though, any momentary suspicions were relieved when he announced that the theme of the date night was “a winter picnic” (<– which was super-cute, being that we are always talking this time of year about how we miss our summertime picnic dates). 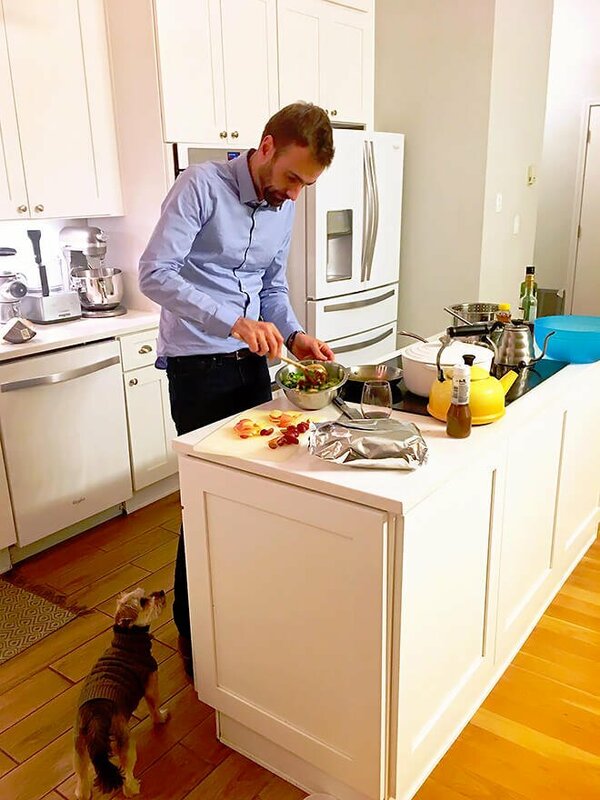 I offered to be his sous-chef, but he poured me a glass of my favorite wine and insisted that he just wanted me to relax and hang out and let him do all of the cooking. So I plopped down at the kitchen island and we turned on some Christmas music and caught up on our day while he cooked. I was assuming the meal would be like every other meal we usually cook together — just a main course and salad, with maybe a cheese plate before or after (<– Barc’s specialty). But after he served the third course, and it looked like there was more to come, I figured I had better document this absolute feast that he was preparing. And I was glad I did, because it kept coming and coming! (Ha, so much so that I regretted filling up on that big cheese plate at the very start. Whoops.) Here are the photos that many of you saw on Instagram — six courses! Each one was absolutely delicious, and had some special meaning to the two of us. For example, the ginger salad was his take on our favorite salad we each order before sushi each Monday night, we make a cheese plate together for a snack probably weekly, he knew that roasted asparagus was one of our favorite veggies, and bacon — well, he knew my love of bacon. It was all incredible. And oh my goodness, by the end of it I was so full. ? 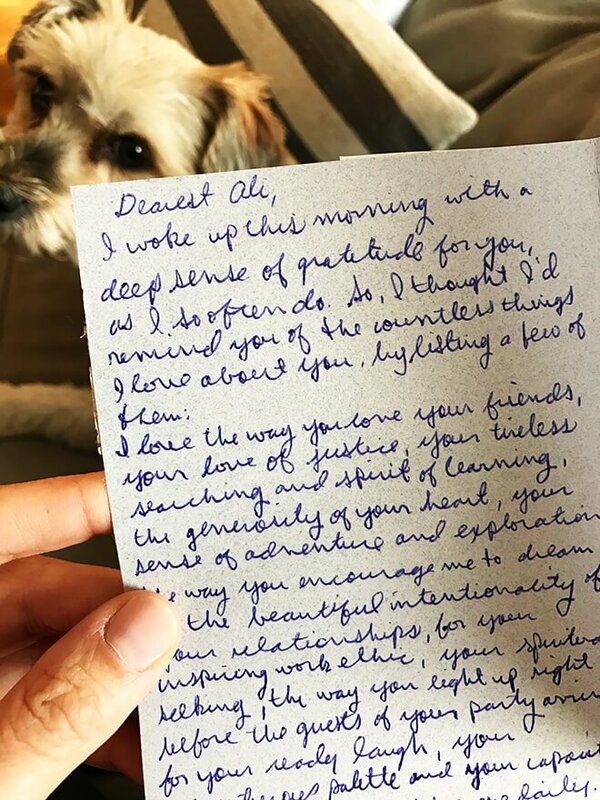 Then, as we were finishing up the final course together, Barclay mentioned that he had written me a card, which instantly made me smile. …he instantly dropped down on one knee beside me. …and pulled a ring out of his pocket and asked me to marry him. Haha, I mean it. ALL of the smiles and shrieks and laughter. ALL of the happy tears and cries of joy (which pretty quickly turned into not-so-classy-but-happy-sobbing). ALL of the kisses and hugs and holding each other tight and both holding up my hand again and again and again to look at the ring. ALL THE FEELS. We probably sat there on the couch for at least 20 minutes just freaking out about the-rest-of-our-life-ness together. Oh, and then I finally got around to asking him how got ahold of this! The ring is was actually 102 years old, and was my Great Grandma Allie’s engagement ring that I inherited years ago. It’s tiny and simple and beautiful and perfect and I had dreamed of wearing it someday. But it was at my parents’ house in Wichita. And — yeah, yeah, I will admit — I had been keeping a wee bit of an eye on Barclay the last few times we were in Wichita to see if he might have slipped away for a bit with them to ask their blessing and get the ring. But he hadn’t! (And I was starting to get a little impatient about that not having happened…) ? Well, turns out that while I was in Korea last month, Barclay went above and beyond to make that meaningful as well. On the day after this enormous event that he helped coordinate at his work (like, imagine weeks of overtime leading up to this thing, and exhausting long workday the day-of), he woke up early on a Sunday and made the 6-hour round-trip drive to Wichita to spend the day hanging out with my parents…and then of course, asked for their blessing and picked up the ring. Finding this out, of course, prompted another round of happy tears. It meant so much to me that he did that. And also meant so much that he’d had a similar conversation with his parents, and that they were all “in” on the big surprise and excited for us. All of their support has meant so much to both of us along the way. Anyway, by this point in the night, I was still a sobby, smily mess. 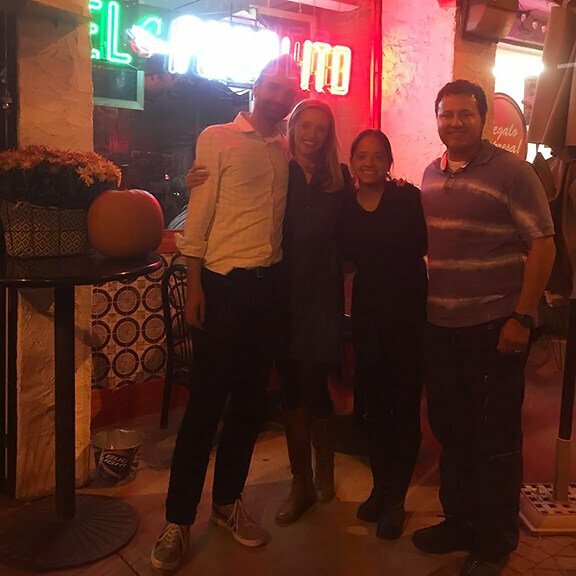 But Barclay told me that he had one more “tiny little dream” for us that night — he wanted to know if I’d go back to El Pueblito (where we had our 7-hour first date) and share a margarita to celebrate together. I couldn’t imagine a better idea, so I grabbed some Kleenex and my furry coat, and we immediately hopped in the car and drove over. …this amazing surprise was waiting for us. As it turns out, Barclay had arranged the whole thing with them and the restaurant owner (who told us we should get married on our first date) beforehand. And throughout dinner, he had been texting them periodically to tell them when to show up. Apparently he had been a little anxious because we were running behind schedule during dinner — which I then delayed with All The Tears after he proposed — but it all ended up working out perfectly. When we arrived, everyone instantly asked us if we had called our parents yet to tell them the big news, and we mentioned that we were thinking of doing so afterwards. 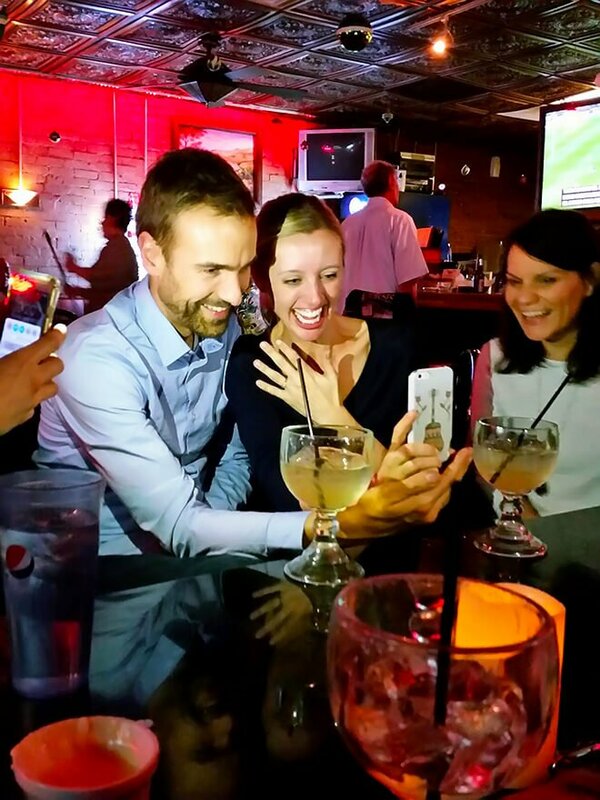 But they insisted we do it soon, so we Facetimed my parents and shouted out to them that “WE’RE ENGAGED”! They cheered on the other end, and we cheered, and everyone smiled and cheered. Ha, but unfortunately it was so dark and the music was so loud in there that we couldn’t hear much else, so we decided to catch up later and called Barclay’s parents as soon as we left the restaurant and could hear again. Which we did, and the smiles continued. Well, turns out that the other best part about him proposing three days before Christmas was that we were able to spend the entire holiday continuing the celebration with friends and family….including our two other dear friends, Erin and Jeff (the two on the right), who also got engaged the same week. So fun! 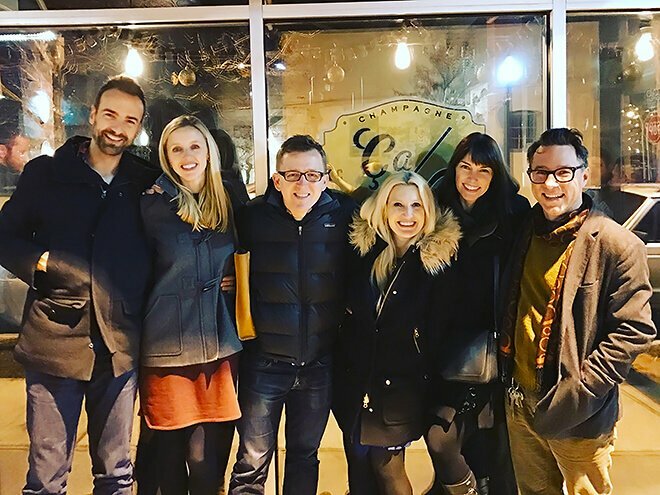 (Also, those are two of our matchmakers there in the middle, Lindsay and Will, whom we will always have to thank for bringing us together.) So much love to be thankful for this Christmas. Anyway, the whole thing felt magical, and meaningful, and exciting, and fun, and so like us. And it made me so thankful for the millionth time for this incredibly thoughtful man who I now get to marry. And much more importantly, spend the rest of my life with, which just feels like the wildest and best thing ever. I love him with my whole heart. And he loves me with his. And not a day goes by that I’m not thankful for the incredible gift that this all is. And, as always, not a day goes by that I’m not thankful for the incredible gift that all of you are. So from the bottom of my heart, thank you for all of your sweet encouragement and support over the years leading up to this point. Barc has been asking this week when I’m going to share the good news with my readers, and I’ve been offline ever since last week taking some time off and soaking up time with friends and family in town around the holidays. But I feel like this is the post that I’ve been dreaming about writing for literally years and years now. So thank you from the bottom of my heart for reading along, and I promise to keep you posted on plans ahead! ? Thank you for sharing your beautiful story! With blessings to you both and all that will share in your love! Oh, and of course, I love your blog! Keep up the good work!! Congratulations and best wishes for a wonderful life together! MCongratulations ?❤️? Thank you for sharing this great story. You are both going to share a great life together. 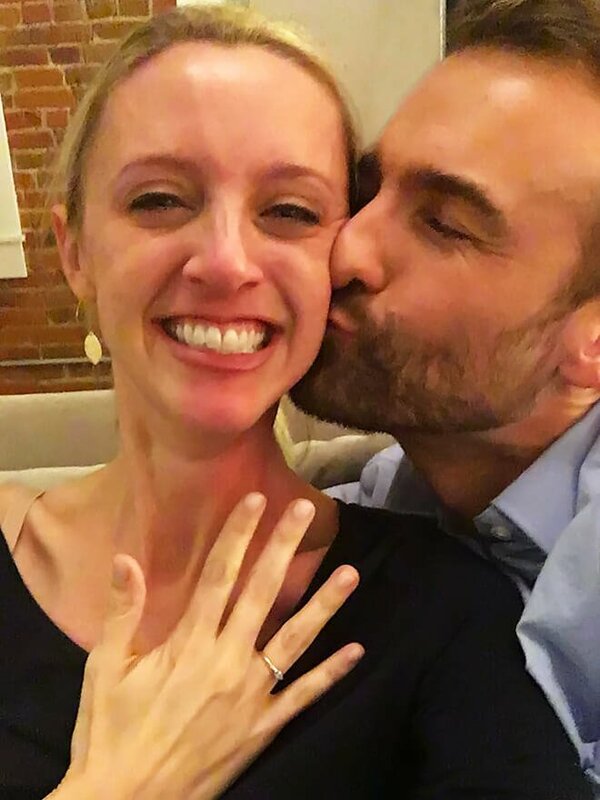 So happy for you two…Congratulations!! What a wonderful and fun story! Congratulations!! I am so thrilled for you both! I am a mom of 3 (my oldest is headed off to college in the Fall) and my hubby and I just celebrated 25 years of marriage. I have been following your blog for a while and enjoy many of your recipe posts but LOVE your personal tales of travel and life and feel a bit like a proud mama for you and Barclay. Congratulations and best wishes!! Congratulations! You are a beautiful couple, and I hope you have many decades of happiness together. Congratulations to you and Barclay! I also inherited my great grandmother’s ring and know how special that is. I wish you two a life full of love and happiness!! What a happy wonderful moment!! It brought me to tears! It is always great to see someone meet their perfect partner and it is such a great feeling. Congratulations! And by the way I love your recipes. Your refridgerator pickles are a house favorite. Congratulations! Love to read how was this beautiful moment. Thanks for sharing. Blessings for your life together. I’m absolutely delighted for you! 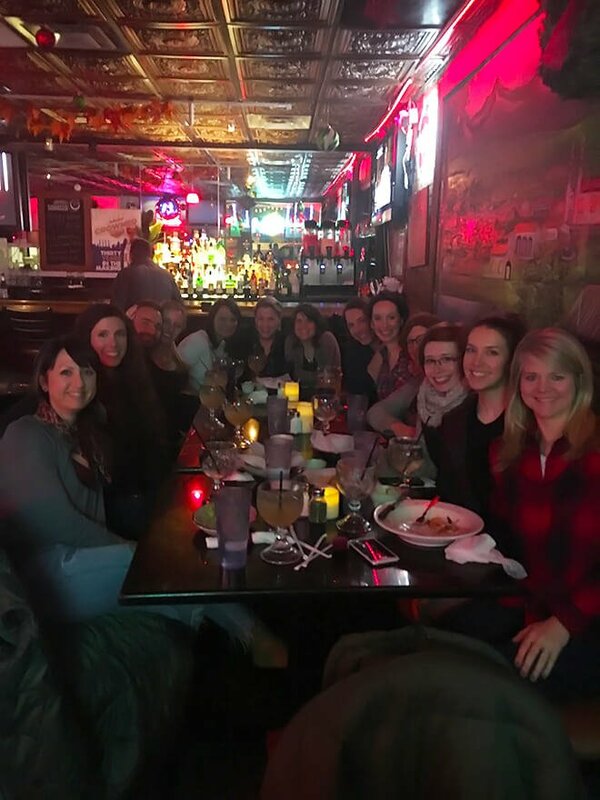 Thank you for sharing your sweet story! Ali! I am so incredibly happy for you! My husband and I rely on your blog weekly and as newlyweds (June 4, 2016), we hope you enjoy this time of planning and wedding anticipation. Thank you for sharing ALL of the details! Congrats! So happy and excited to feel like apart of your beautiful story! Wish you all the best! Congratulations! And thank you for sharing your beautiful story with us! I love your blog!! Congratulations! Every time you would come back from one of your trips, i was sure the post would end with “And we came back engaged!! !” So happy for you both! This is my first time visiting your site, I LOVE IT!!!! Congratulations on your engagement may you continue to be happy and healthy. I am extremely excited to have run into your site and will continue to follow..
Congats best wishes to you both!!! What a great story and I’m so happy for you, I couldn’t stop smiling while reading. Happy for you both!! Cheers! Congratulations! That is a great story! you guys are so CUTE – congratulations! 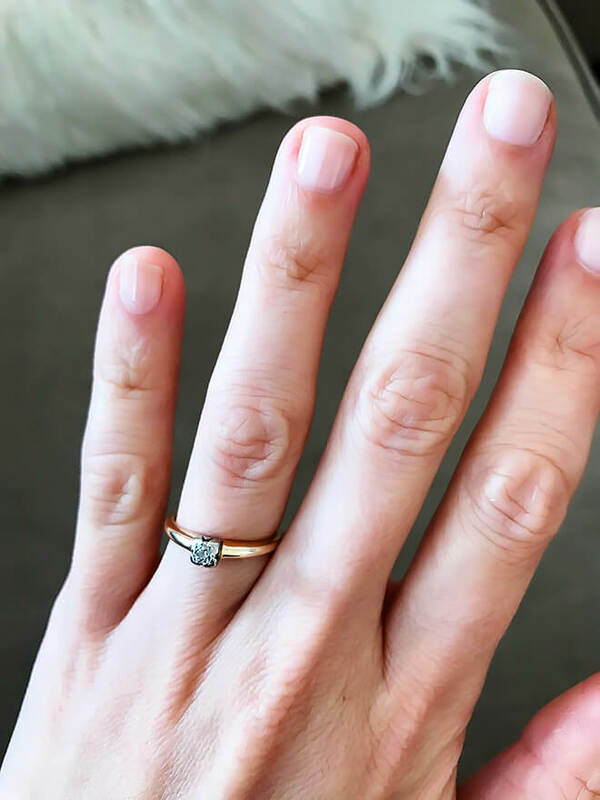 Beautiful story and I love that you have your great grandmas’ ring! Congrats! This is the sweetest story ever! Made me tear up!! You two are adorable! yay! So glad to hear the good news. All the best to you both! I’m in tears…what a beautiful, absolutely meant to be story. Over the moon for you! Well I’m just a ball of tears over here. Congratulations! What a beautiful story. I wish you both so much love and laughter. I just saw this again and wanted to say congratulations again. I’m so excited for you two. My Hubster & I celebrated 40 years together, in January. When the day comes & you feel sick of each other, plan it so one or the other feels it, not both at the same time. I’ve found my Catholic Faith to be a huge blessing. May everything be full of joy, this year & every year! OMGoodness!…I don’t even know you, yet I am so happy for you and Barclay!!! 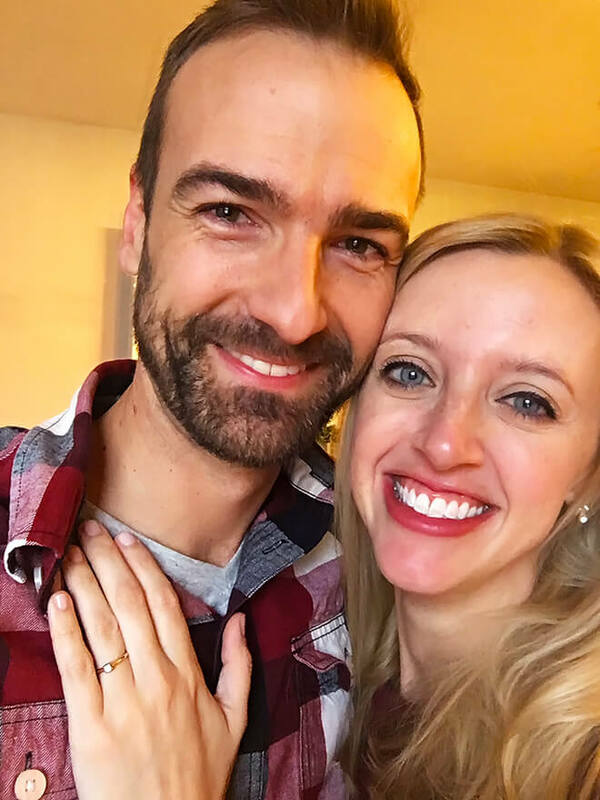 I stumbled across your delightful blog while on Pinterest today, then read the post called “I said YES”! What a heartwarming story! I’m so happy for you both and wish you a lifetime of shared dreams, adventures and much happiness together! :) Reading your story renewed my hopes too of meeting someone incredible and amazing. Thanks for sharing your story. You’re a very talented, engaging writer!! This is the most beautiful real life happening I have read in a long time. Thank you so much for sharing the details! It swept me right up, into the moment with you. Tears of joy for you! Absolutely incredible. Much love to you both! New to your blog! Found it looking for a Coconut oil biscuit recipe! What amazing story of love and romance! You are truly a blessed your woman!! Congrats! Keep us up on all the wedding details! God bless u both on your engagement, I pray God’s blessing on you both for a long and beautiful journey. Enjoy every moment with each other. BTW, I love ur Barclay’s name it happens to be my last name. Be blessed! Congratulations, I will you both a wonderful life together, may you both always have patients for each other and remember the feeling you had when he asked you to marry him and let him always remember how great it was to plan it. Love is the best feeling of all, and I see in both of your eyes how much you love each other. May God bless your union. Hi Ali, a Google search for sparkling margaritas brought me to a recipe on your website. 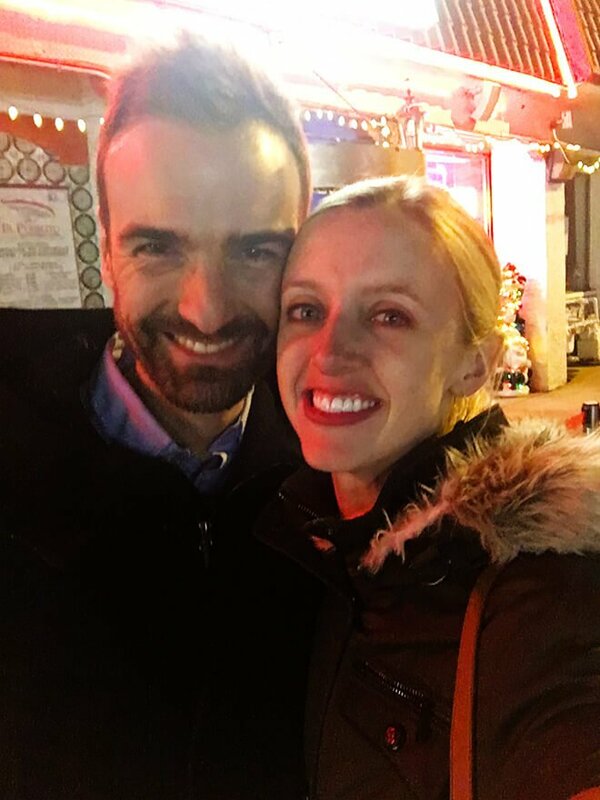 That led me to read your New Year’s blog, which led me to read your “10 Things I So Look Forward To… blog, which led my to read your “I Said Yes!” blog, which led me to your Mint wedding website. Your life stories are beautiful, inspiring, and insightful. Thank you for sharing them. Many continued blessings for you and Barclay. Oh, and thanks for the great sparkling margarita, CHEERS!! !